Thus far this series has been an interesting balance between two stereotypes. On one side there is the cold blooded assassin versus the other side which is the doting and dedicated housewife. With this story operating between these two extremes, it was inevitable that the two meet somewhere, and they do here, although perhaps maybe not as much as expected. 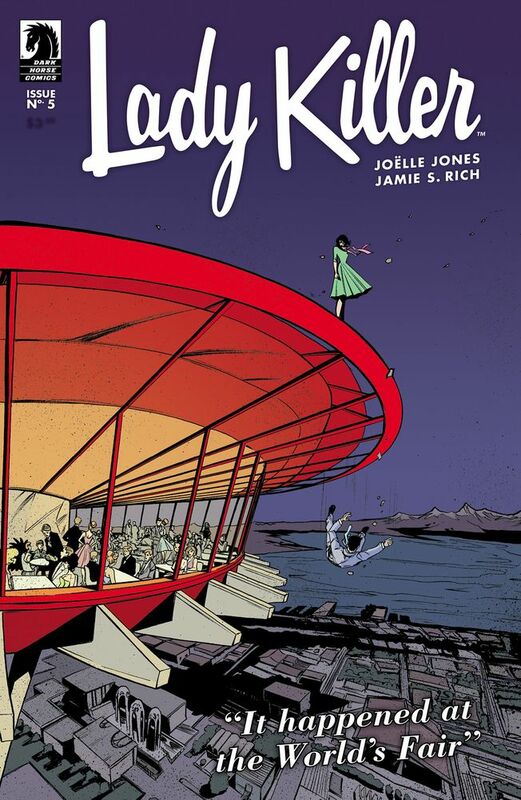 After her betrayal of her handler and her life as a killer for hire, Josie confronts her former employers at the site of the World’s Fair in Seattle. The only problem is that her family unexpectedly shows up as well, potentially ruining her undercover work as she tries to get closer to those that would have killed her. It sets up an interesting dynamic as the two worlds seem ready to collide, but they are rapidly taken apart again as Josie goes on a rampage aided by the others that she has recruited for her cause. What follows is primarily an action heavy plot, with the characteristic gruesome violence. In the end the story is not wrapped up as much as one might think, but it is only because this final issue of the miniseries is only meant as the beginning of a longer series. In the letter column, series writer Jamie S. Rich describes how he is moving on to other projects with other companies, and that this story is now Joelle Jones’ own, rightfully as it mostly has been all along. Finally proving herself as a writer equal to match her artwork, this series’ ending is not as powerful as one might expect, although it is really with the main intention of setting up more of Josie for the future. As it stands this is still a great series and this final issue has done it justice. With more of Josie to come it would seem as though there are still lots of interesting stories to tell.